Kyan Chotoku, teacher of Nagamine Shoshin. Posted in Kyan Chotoku, Misc, Unknown Ryukyu	| Tagged Arakaki Ankichi, Arakaki Ansei, Kyan Chotoku, Nagamine Shoshin	| Comments Off on Kyan Chotoku, teacher of Nagamine Shoshin. 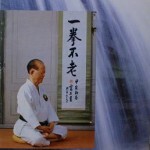 Posted in Book Reviews, Unknown Ryukyu	| Tagged Chibana Choshin, Nagamine Shoshin, Okinawa Karate, Okinawa Karatedo Renmei	| Comments Off on Flurry styles of Karate? Nagamine Shoshin: Shijitsu to Kuden ni yoru Okinawa no Karate, Sumo Meijin-den. Tokyo, Shin Jinbutsu Oraisha 1986. More Galleries | Comments Off on Nagamine Shoshin: Shijitsu to Kuden ni yoru Okinawa no Karate, Sumo Meijin-den. Tokyo, Shin Jinbutsu Oraisha 1986.